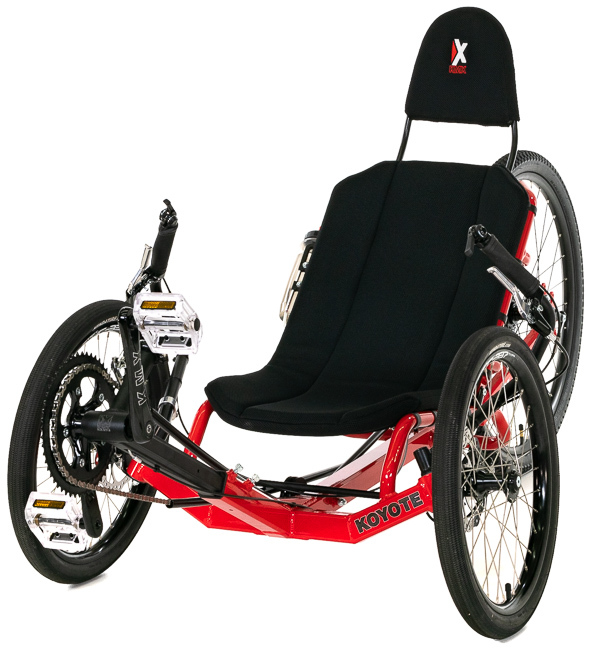 KMX has been known for their tough, and yet relatively inexpensive, entry-level sports trikes. 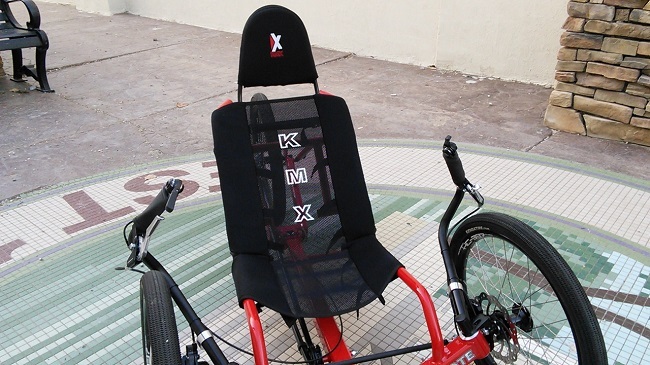 The KMX Karts offer great quality, durability, and capability at a reasonable price. 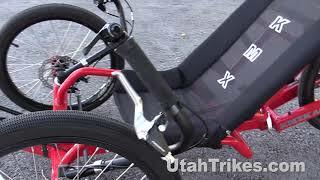 The new KMX Koyote hasn�t changed in that regard, but is a whole new breed of KMX. While more expensive than the Venom model it replaced, the Koyote has a completely redesigned frame, several new features, and upgraded components. 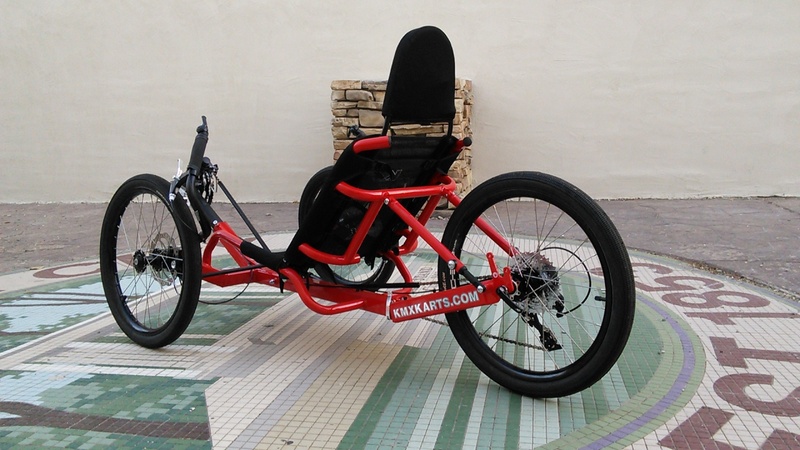 The two biggest changes the Koyote has seen over KMX�s previous top of the line trike, the Venom, is that it KMX has built the Koyote with an integrated mesh seat rather than the bucket seen on all other KMX trikes, and it has a newly designed folding frame. It retains the extruded square-ish aluminum frame, and bar end shifters, but the rear gearing has now been bumped up to 10 speeds. 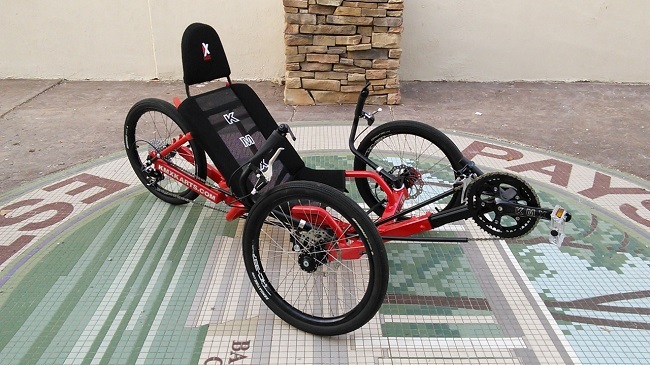 Speaking of drive train, this trike has a 20-speed gearing setup with a nice 52-42 double up front, and a wide 11-36 cassette in the rear. Shifting is handled by Microshift bar end shifters that provide a nice responsive feel, and keep the grip area smooth for comfort on long hauls. The rear shifter controls a Microshift XCD rear derailleur, which finds each gear with quick precision, and never misses. 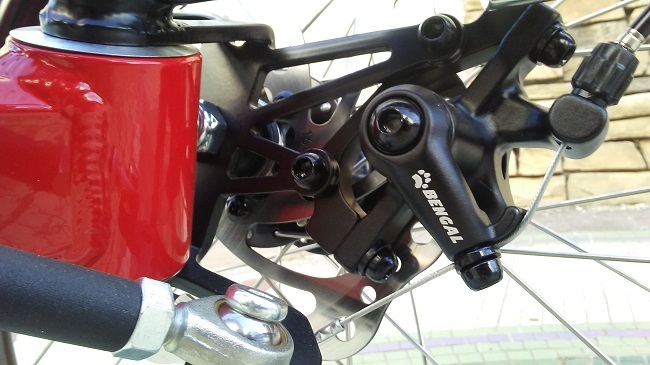 Despite being less expensive than other brand 10-speed derailleurs, the Microshift unit looks expensive and shifts as good as derailleurs twice the price. 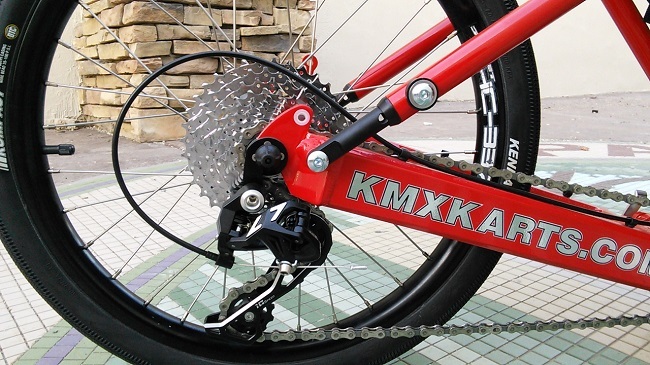 Controlling the front gears is another Microshift derailleur that handles the double with ease. 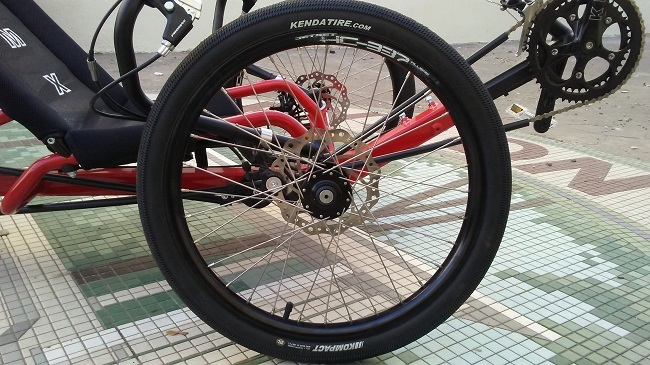 The stock Wheels are 20� 32 hole Aluminum Jetset 337 double wall, wrapped in Kenda Kompact 20X1.75, and they feature a smooth tread pattern, with built-in Kevlar liner to help protect against flats. They roll nicely and seem to hold up to the rough, thorn ridden roads our area has. Brakes are 160mm Bengal discs being pulled by two Promax locking levers. 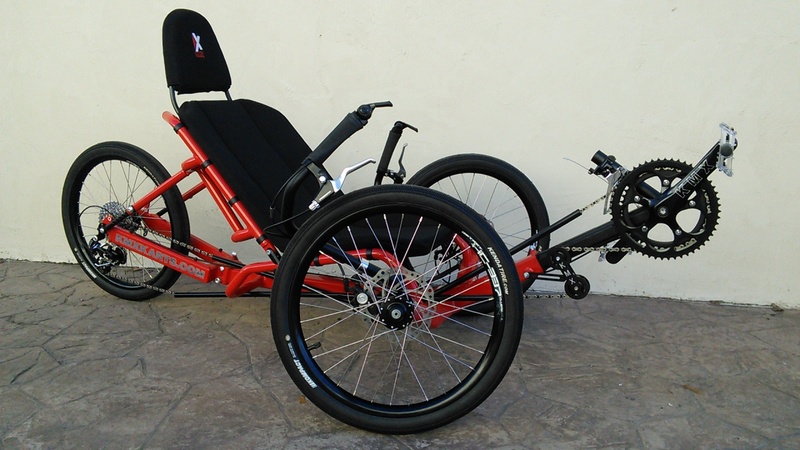 These are pretty standard components with several trike manufacturers. They offer good feel, and plenty of stopping power. 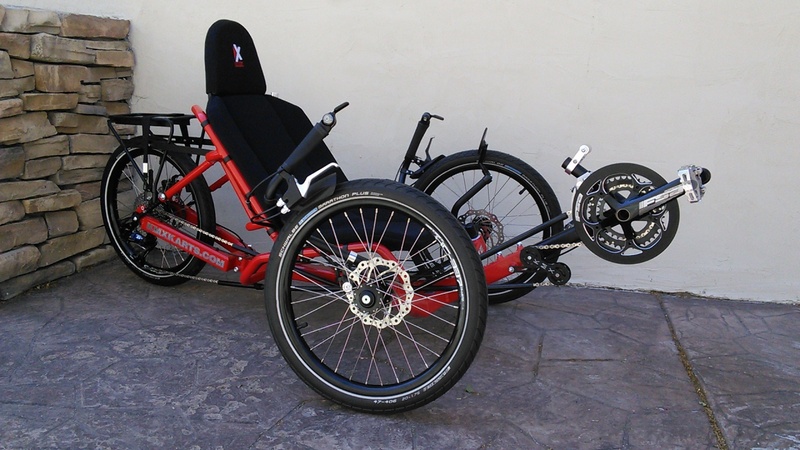 The locking levers are very convenient when getting on and off the trike. One of the biggest changes the Koyote has seen over previous KMX trikes is the use of a mesh seat rather than the bucket on other models. The advantages to this design are improved comfort on longer rides, more breathability, and more adjustability. The seat itself is higher in the shoulder, and has an integrated headrest which helps with comfort for taller riders. 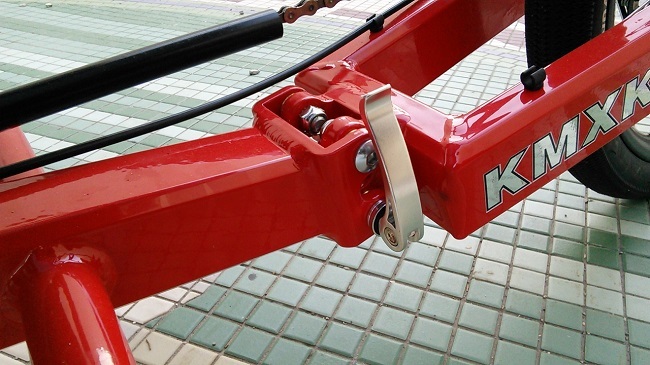 Along with the revised seat, KMX has changed the handlebars on all models, making them wider to help decrease turn radius, and increase the clearance between the tire, and handlebar. The main frame on the Koyote is made of extruded aluminum. This was introduced with the Venom model. The tubing profile has additional strengthening features inside the tubing which allow for use of thinner material to reduce weight and increase strength. 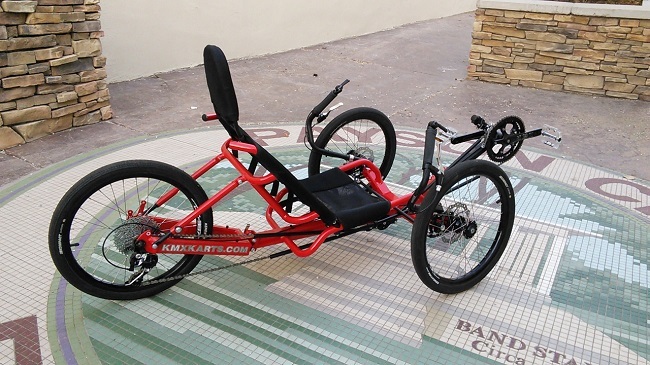 Along with the lightweight materials, the frame also incorporates a folding hinge at the rear, to cut down on length making it easier to store, and transport. It does not require removal of the seat, so fold time is quick, and quite easy to do. With the updates made to this new model, it really pushes KMX from a sprinter, into something that can be used for longer distance riding, and more serious performance riding. with improved comfort and functionality across the board.